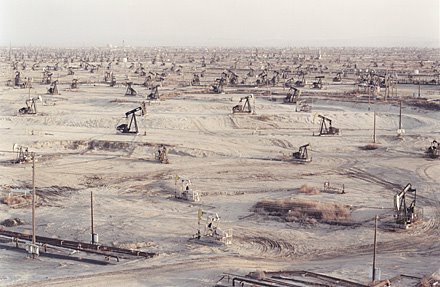 Yep – more Edward Burtynsky, this time from his “Tailings” and “Oil Fields” series. 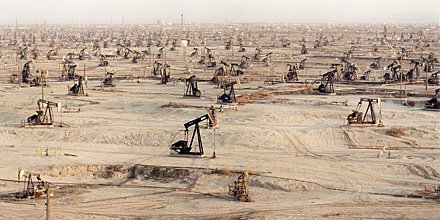 Or “Oil Fields” and “Tailings,” as it were. But these are just great, I think. 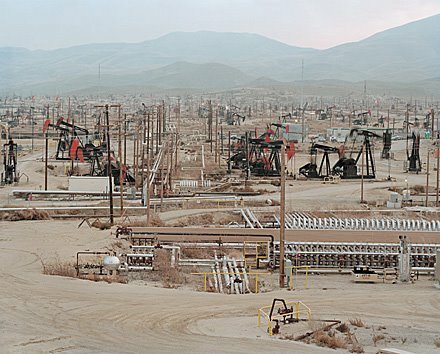 The human encounter with geology all over again, desert landscapes processed for their petroleum wealth. 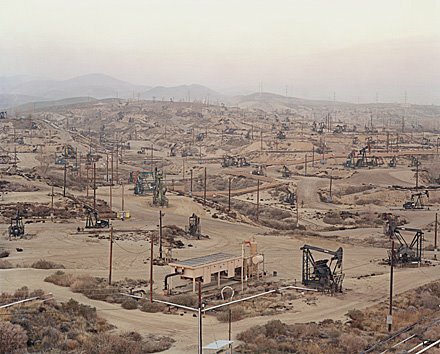 The above oil fields are, specifically, in Belridge, Taft, and McKittrick, California, towns pump-fucked by industrially re-evolved gigantoid mosquito-machines, solitary insects of metal, lubricated by the very oil they’re sucking on. 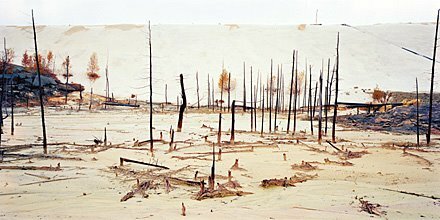 But then we shift latitudes and cross the border to Canada, visiting Elliot Lake, Ontario, where uranium mining has produced a weird white hydrology, rivers of fractal uranium tailings, a run-off landscape, powdery, radioactive, self-silting, where an exhumed, abiotic mineral has replaced the multi-hued autumnal earth with an abstract, gesso-like backdrop, framing dead trees against absence. 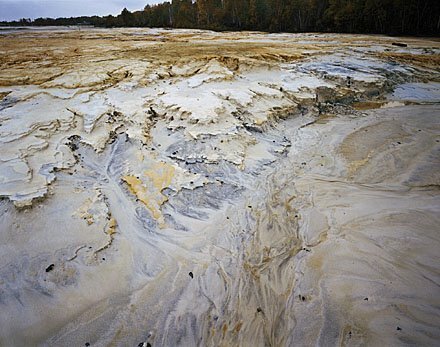 The micro-fractal landscapes of pollution, now here with us for perhaps millions of years. Landscapes without time limits. Landscapes without expiration. What future botany will appear here on this white, skeletal crust?